TigerText: An iPhone App for Cheating Spouses? Why Do Men Keep Apologizing? Tiger Woods, if you're reading this, remember that you've been through what mothers call a "valuable learning experience" and you're probably a "better man for it" and so on. Having said that, an iPhone app that launched on Feb. 25 could totally have saved your hide. Called, coincidentally enough, TigerText, it allows users to set a time limit for a sent text to hang around after it has been read. When that life span has been exceeded, the message will disappear, say the developers, from the recipient's phone, the sender's phone and any servers. The message cannot be forwarded anywhere, stored anywhere or sold to any tabloid for an undisclosed sum. It works like this: when, say, a prominent politician sends his mistress an iPhone message via TigerText, the mistress will be prompted to install the app. When she has done so, she can read the message, but she can't keep it. 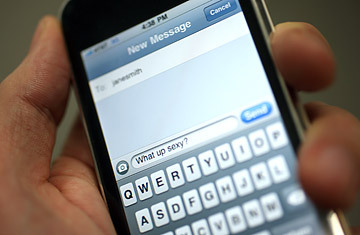 In fact, the message is never actually sent to her phone; it's stored on TigerText's servers. After the politician's specified time span has elapsed  anywhere from one minute to five days  the message ceases to exist. There's even a "delete on read" setting, which counts down from 60 after a message is opened and erases its text at zero. While the implications for philanderers  and spies  are obvious, the app was not actually developed for them, says TigerText founder Jeffrey Evans, a former recruiter and headhunter, and not, at least on the basis of one interview, a particularly paranoid guy. The name was in place before the Tiger Woods texting scandal, he claims, and the company decided to stick with it. Evans' real concern is about privacy. "People text like they talk," he says. "And some of the things they say, taken out of context, can come back to haunt them." He points out that the European Union ruled in 2006 that phone and Internet providers were required to keep all cell-phone and e-mail data for a certain period of time. "That just seems wrong and an invasion of privacy," he says. "We have not caught on to the implications of all these conversations being kept for so long." While he acknowledges that the app might also be a boon to teens who are in the habit of sexting, drunk texting or "running off at the thumb," he thinks lawyers and their clients and business executives involved in complicated deals will be even more interested. Obviously there are times when you just shouldn't hit "send"; at its most basic level, TigerTexting is like paying $2.50 a month for stupidity insurance. But let's face it: who among us has never needed a do-over? See Cheating 2.0: apps that make adultery easier.